SKU: FPP. Category: Waxes & Polishes. When used as the last buffing step, Jax Wax Foam Pad Polish not only creates a Dazzling Gloss, but also removes Buffer Swirl Marks and Surface Imperfections. Jax Wax Foam Pad Polish removes 3000 grit sand scratches and similar substrate imperfections. Jax Wax Foam Pad Polish buffs without gumming or clogging pads. 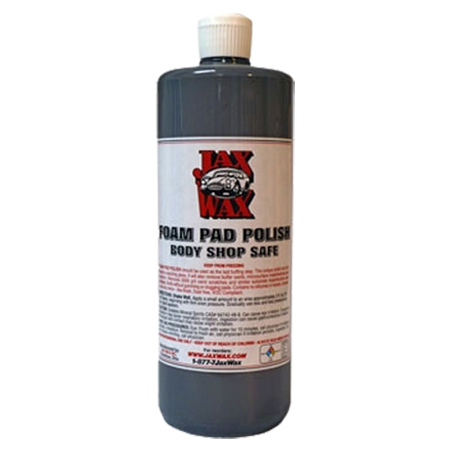 Jax Wax Foam Pad Polish also will remove slight oxidation from your finish. Jax Wax Foam Pad Polish leaves a non-oily mirror finish and is Dust Free. 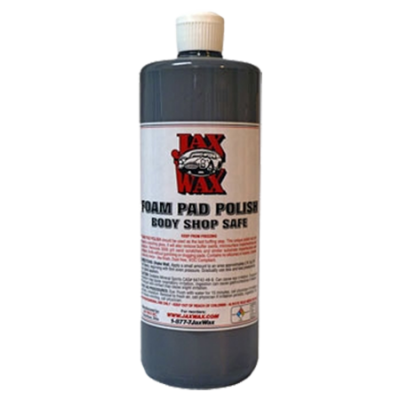 Jax Wax Foam Pad Polish contains no silicone or wax and is Body Shop Safe. 2. Apply a small amount to an area approximately 2' X 2'. 3. Buff slwoly, begining with firm, even pressure. 4. Gradually use less and less pressure as high gloss appears. 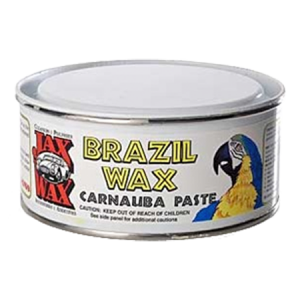 Be the first to review “Jax Wax Foam Pad Polish” Click here to cancel reply.